In the previous post we validated our install and ran a simple detector in C++. It is now time to start optimizing it. Source code for the finished project is here. 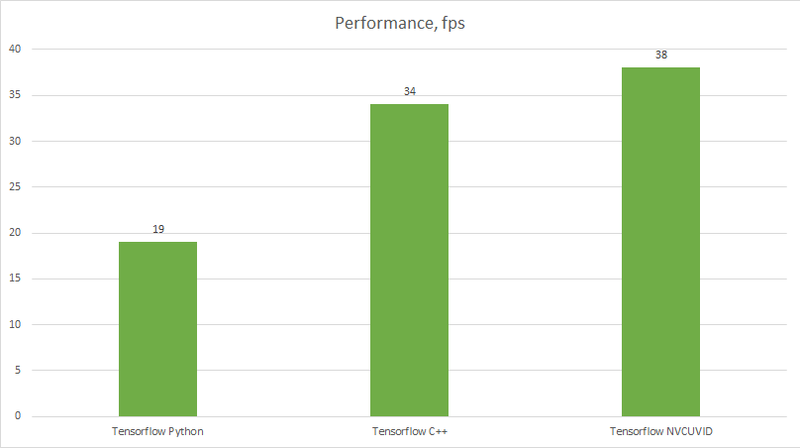 If we build and run the video_reader.cpp OpenCV sample, we will observe a staggering performance improvement available in OpenCV for decoding and reading video. It is somewhat tricky to make the actual sample work, so I summarized the necessary steps gleaned from some wise folks on GitHub Issues in this repo. As the screenshot above shows, we have an order of magnitude performance improvement by decoding the video and leaving frames on the GPU. At this point this is our performance increase potential: not only will it allow us to skip unnecessary and expensive memory copies, but also will set the stage for TensorRT which consumes data already on the GPU. The first step towards this goal is to optimize feeding the Tensorflow graph. We are now working with the final version of this application from this repo. The first thing to do is to allocate a GPU tensor and fill it with decoded data, which, at this point, is also residing on the GPU in a GpuMat structure. Let’s deal with this copy first. Here we are just as lucky as we were with bridging Mat with Tensorflow tensors. A noteworthy bit here is on line 6: the decoded frame has 4 channels, we use cvtColor to drop the transparency channel our network does not use. CUDA 10 is depricating memoryType attribute, so the conditional compilation avoids compiler warnings. Doing this is not standard. See a long discussion on GitHub. There exists an experimental technology, so things will probably change, but as of release 1.12 it still works. This is a sample from Google. Profile was taken over 20 seconds and we can see the difference in bytes moved back and forth. Also we can see individual bursts of 2.76 Mb moved from host to device on the “CPU” profile that do not appear on the “GPU”. It is easy enough to calculate that 2.76 Mb is the size of a decoded frame. So, how much did we gain through all this? A whopping 10%. We did expect more for all this work, however we will use what we learned to enable bigger gains down the line. It is now time to move to TensorRT. A software developer passionate about functional programming, philosophy, languages, life.